In ancient Greece, gold wreaths were permanent and luxurious facsimiles of natural wreaths made of oak, myrtle and laurel leaves. Both gold and natural wreaths were an important aspect of ceremonial and religious life. They were often given as awards for victory in battle, public service, and excellence in athletics and the arts. Gold wreaths were also used as votive offerings to the gods and included in funerary rites as symbols of the deceased's victories in life. Oak in particular was sacred to Zeus, king of the Olympian gods, who spoke to his priests through the rustle of oak leaves. Greek gold wreaths were made from a thinly hammered sheet of gold that was formed into a narrow tube over a core of pitch or resin. 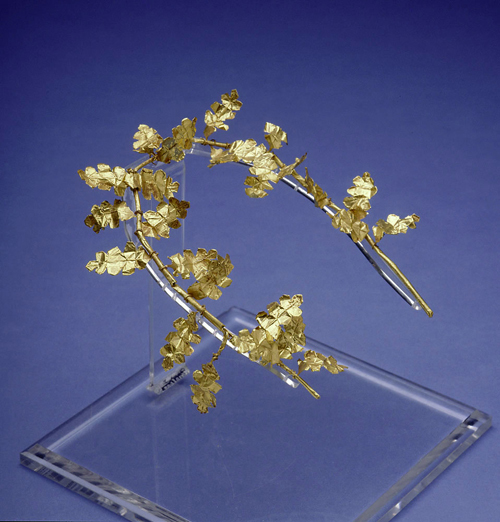 The tube was ornamented with leaves, also cut from gold sheet; these leaves were attached by stems that were either wrapped around or inserted into holes in the tube. Surface details were created with a variety of tools and punches.